My little guy has a cough. We were up most of last night; mysteriously, my son is super chipper this morning, so I guess his cough didn't disturb his sleep as much as it disturbed mine and my husband's. Kids are so much more resilient, right? Anyway, I remembered this neat idea I'd pinned a while back and decided to give it a try. It's from The Chick n Coop and it sounded simple enough. Click here for her full set of instructions. You could totally use this technique to just make cough drops, but I think the lollipop is safer for young children. Honey is no joke when it comes to soothing throats and reducing coughs. One study of cough remedies found that "honey produced the greatest improvements when it came to better sleep and reduced cough frequency and severity." My son ate a few spoonfuls of honey last night—less work than making lollipops—but announced he didn't want to do that any more today. Kids are as fickle as they are resilient, I suppose. 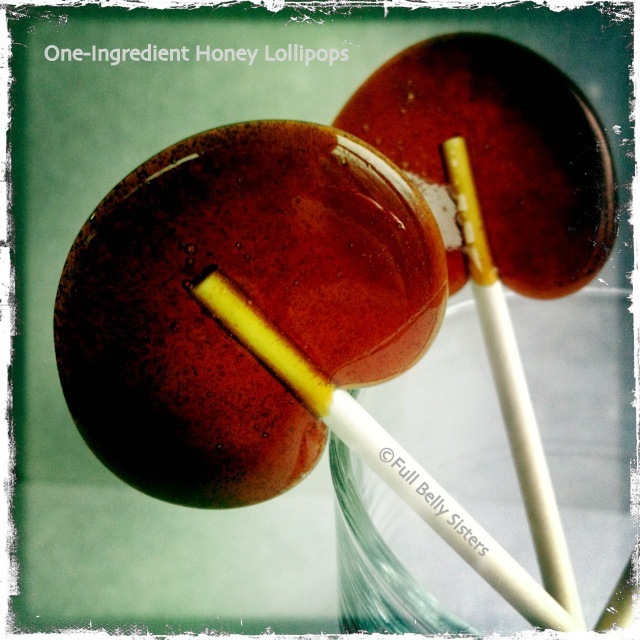 I actually used just 1/4 cup of honey and came out with 10 lollipops. I didn't have to boil them for as long as she did in the original recipe. My silpat mat worked great; I suspect parchment paper would work well, too. 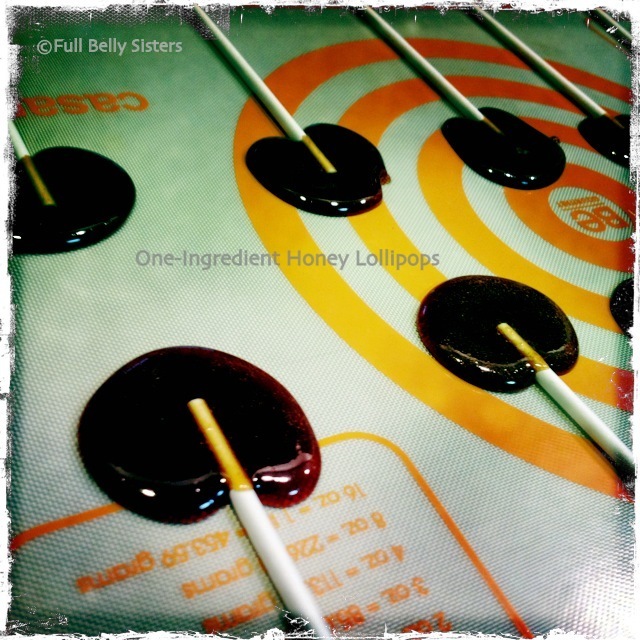 The funny thing is that I'd bought a candy thermometer back when I'd first pinned this idea, but I have no idea where the heck I put it. So, I winged it and they still turned out fine. I did use the technique mentioned in the original post; I put a few drops in cold water and they were solid, so I knew it was ready. They turned out this lovely amber color. And the caramelized taste reminded me of a toasted marshmallow! I stored mine in a large jar with pieces of wax paper in between, so they don't stick to each other. I think they'd be fun to use as stirrers in hot tea, too! UPDATE: Got this review on our Facebook page: "Just made these for my daughter who's been coughing / wheezing all day after being out last night at a living nativity. Gave one to her while my husband was combing her hair after bath. Within 5 min she wasn't coughing. And she just ran over to give me a bear hug cause she feels so much better. Thanks!" I love how simple these are! I will try these when I have a sore throat. Thanks for this idea!